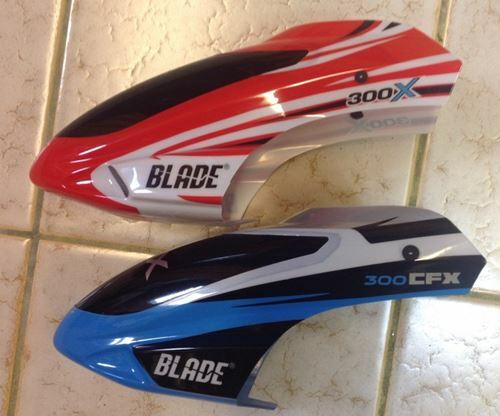 Before getting to the Blade 300 CFX review, I thought I should say a few words about the original Blade 300X. Ever since Horizon Hobby announced the release of the original Blade 300X back in early 2012, when I just started to learn about RC-helicopters; I had missed a thorough review of that little bird. Of course, since nobody had had it in their hands at that time there was no review existing. 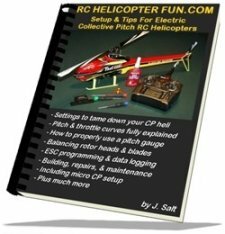 As my skills of flying RC-helis became better and better over the first half of 2012 (with the help of John’s website by the way – and thanks for that!) I became bolder and finally decided to purchase the 300X literally the same day it became available over here in Germany. I “ripped” it right out of the hands of my local hobby shop manager even before he managed to put a price tag on it. As my experience with this great little helicopter increased, I started to do reviews of it on a German forum. Together with other 300X enthusiasts, we developed a 300X knowledge base and shared every new insight into its capabilities, shortcomings and bug-fixes. It is not so intimidating due to its small size. Since it is a Blade, spare part availability is excellent (at least where I live). It comes with the AR7200BX integrated RX/FBL unit that is reliable and easy to set up. So despite it’s small size it comes with a full blown FBL unit. It flies very stable and is relatively easy to control if tamed down by using an adequate TX (such as the DX6i). It is pretty robust and can survive minor crashes, sometimes even without any damage (even though all 12 crashes I did caused me to repair it). If it crashes, then the wooden blades absorb a lot of the crash energy by breaking into pieces, thus reducing the impact to the rest of the mechanics. After a few months the price for a new bird came down substantially so that also from a cost perspective it became a relatively low entry hurdle for many beginners. It can carry batteries up to 1800mAh (standard = 1350mAh) and in combination with a low head speed it supports relatively long flight times of 8 minutes and beyond. Its red, white and black color scheme provides a reasonable visibility when airborne. The soft plastic material that the frame is made off. This led to a flexing of the rotor mast, causing main shafts to break in mid air and servo horns to be ground (or is it “grinded”?) by the motor bell resulting in ugly vibrations. The motor bearings. 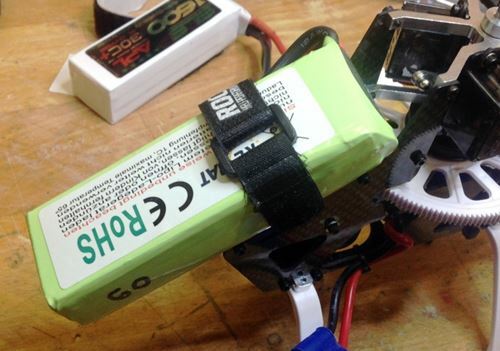 Some of these e-flite motors killed themselves after less than 10 flights. 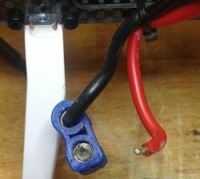 The relatively weak BEC component on the eFlite ESC, causing brownouts on the RX in many cases. The proneness to high frequency vibrations in general, causing the BeastX unit in the AR7200BX to perform the infamous “RROD” (right roll of death). Further shortcomings reported by others in forums did not occur on any of the 10 Blade 300X models that I personally had my hands on, so I refrain from listing them here. The good thing about all of these defects is there is a fix to all of them – most of which are easy and cheap. When Horizon Hobby announced that they would stop selling the 300X and replace it by a 300 CFX in early 2014, I was extremely curious about how they would deal with it’s predecessor’s shortcomings. So let’s switch to the main topic of this review. Just like with the “old” 300X I went to my local hobby shop the same day it got released over here. And just like 2 years ago, the shop manager did not manage to put a price tag on it before I “ripped” it out of his hands - see how addicted I am. John warned us, but we didn’t listen – at least I didn’t. My first impression after unboxing was pretty positive. All parts seem to be high quality. The CF side plates look great, very precise cut with a smooth and even surface. All the aluminum parts such as the bearing blocks and the head-assembly look very nice as well with a smooth finish. I checked on all of the screws and found that they were all secured by Loctite. Those few I opened completely, showed the typical residue of a thread locker. 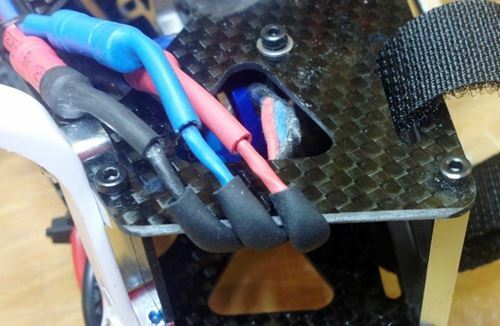 The three motor wires between the motor and ESC are bent around a sharp edge in the front of the carbon frame. When I unplugged the wires , they already showed marks on the insulation. Since I don’t want to lose a heli due to motor wires being rubbed through, I filed the carbon frame round and added some shrink tube to the wires – an easy fix. I then checked the rotor blades. Besides the fact that the stock CF blades do not have a smooth surface and give a “cheap impression” they were also completely out of balance, forcing me to put a big piece of film on one of them to balance them out. When I tried to remove the rotor hub from the main shaft, it was a bit tricky. The head did not want to come off easily, so I had to apply some force. After the head had finally come off I could see the reason. The tip of the main shaft was completely corroded. Incredible! Since I use 4mm bullet connectors on all of my smaller birds I also had to remove the EC3 connector. When pulling lightly on the wire to get the 3mm connector removed from the blue plastic plug, I ripped the wire right out of the connector, revealing what I suspect to be a “cold soldering point”. I am glad I exchanged it – otherwise this could have led to an overheating or even a loss of power during flight. The mechanical setup was very sloppy at best. I could see with my bare eye that the servo-horns were not centered at zero pitch. After centering these (BeastX setup menu G) the swashplate was out of level. Checking the three control rods showed that they all had a different length. So to cut it short, I had to re-do the entire mechanical setup (on a helicopter that is sold as “test flown and ready to fly”). Looking at the AR7200BX I found that the dial #1 (cyclic sensitivity) was set to minimum. For me a hint that the test flight had not been performed by someone who understands the BeastX system. I did not realize this by the way until after I had done a few flights and was wondering why the heli initially flew like a drunken bee. New 120° servo geometry - This is a great “buzz word” used to advertise for the heli. To my experience however that’s all it is. It looks nice and very professional, but after over 5 hours of airtime with this bird I still doubt that more than 1% of the heli pilots will ever be able to tell the difference between this new geometry and a regular one. The flip-side of this is, that the new geometry makes it more difficult to exchange servos and set them up correctly. Canopy - The plastic canopy with its blue/silver/black color scheme is identical to the 300X in terms of dimensions, shape and material. The only mechanical difference is that the mounting grommets are further to the back. The new color scheme however (besides looking nice) is completely useless when it comes to flying the heli in difficult visibility conditions. It is pretty hard to tell its orientation when in the air. For beginners I would recommend to exchange it for a red/white 300X canopy. Battery options and the center of gravity - Well, first of all the Blade 300 CFX does not come with a battery at all (HH calls this “BNF basic”) – they do however recommend a 1350 mAh battery which is identical to the one that came with the 300X. From my 300X experience I put a 1600mAh pack on right away expecting the bird to be just a bit nose heavy with this. To my surprise, the Blade 300 CFX was still clearly tail heavy with this larger battery. Nothing much to worry about, since the FBL system will compensate for that easily, nevertheless I would consider this a design flaw. The surprising thing resulting from this is you can mount a 2200mAh standard 3S battery on the battery tray and still get the canopy mounted without having to adjust anything. With this 2200mAh battery the little heli is exactly balanced – what a surprise! While a 2200 size battery of course makes the bird pretty heavy and increases the (already high) disc load, it also allows for flight times of 10 minutes and more (!) a nice thing for beginners. So in other words, it’s not a bug, it’s a feature! 11 tooth pinion on the motor - The 300X came with a 9tooth pinion, so the new transmission ratio allows for a significantly higher head speed – and “holy cow!” this really shows in flight! – I was very surprised how agile this helicopter has become due to this, compared to the 300X. One of the good aspects of this helicopter. Carbon frame - The frame does not only look nice but also finally provides the rigidity that the predecessor was lacking so badly. Good job on this one Blade! Aluminum “bling-bling” - I understand and support that the bearing blocks in the frame are made from aluminum . This makes perfect sense to me! However the aluminum head as well as most of the other aluminum parts added to the heli are nice to look at, but they don’t provide any added value in my perspective. I had one of my old 300X upgraded to the aluminum head but could not tell any difference in flight characteristics – so I sold it after a few flights and went back to the plastic head (which by the way is great). eFlite 320H Motor - This is the same motor that the original 300X came with. The same motor that is prone to develop bearing issues after just a few flights. Since this problem was reported over and over in many forums such as helifreak.com, I do not understand why Blade did not put an upgrade into this. eFlite 25A ESC - Well, guess what! This is also the exact same ESC that came with the original 300X – the exact same one that had issues with current draw from the BEC component causing brown outs. 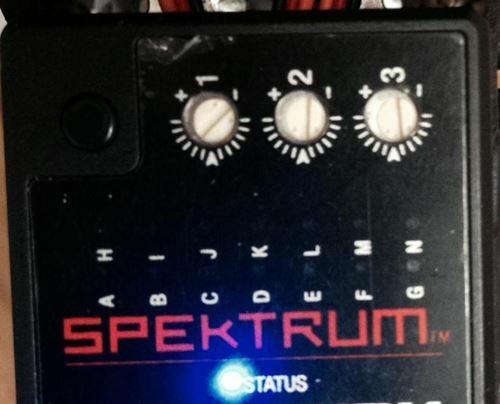 Another component that I would have expected to be overhauled in a “V2” of a helicopter. Servos - The DS76 / DS76T servos are also the exact same ones that came with the old 300X and that are also in the 450X. 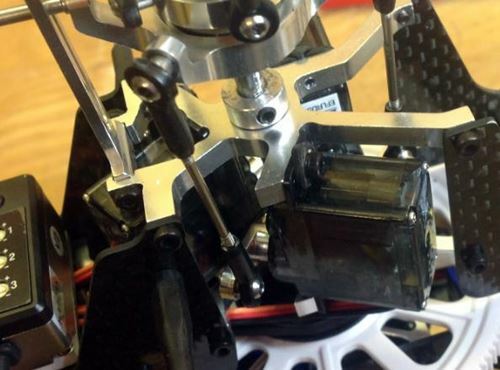 While others had reported problems with some of these servos failing. I did not have any failures over the course of two years that were not directly related to abuse or crash. In fact, when they strip out due to a crash, the plastic gears are very easy and very cheap to replace. Of course these are not “top notch” 3D servos, but I consider them more than sufficient for most pilots. Position of the AR7200BX - Another clear improvement over the original 300X is the position that the FBL unit was placed in – on the Blade 300 CFX you now find it on the upper back position, sticking on the gyro platform. This allows for easy access and reduces the risk of vibration transmission. The old 300X had the FBL unit “downstairs” in between the frame. Tail assembly - Practically the entire tail boom, including the tail case and tail rotor is identical to the one that came with the 300X. I admit that there have been reports of problems with this, but again none of the 10 300X birds that I had my hands on showed these problems to an extent that would cause me to be dissatisfied. And with the Blade 300 CFX, this has not changed as far as I can tell. 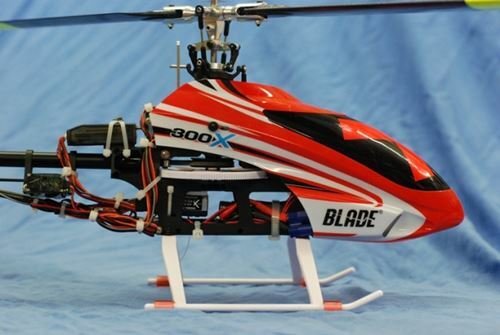 So, How Does The Blade 300 CFX Fly? After fixing all of the quality and setup issues mentioned above (which caused me to spend more than 5 hours in my hobby room btw) I was very eager to get out and fly the new bird. As mentioned above, I had some trouble with instability during the first flights until I discovered that dial 1 on the BeastX had been set to minimum. After I fixed also this, I can now state that the heli really flies just great. The increased headspeed in combination with the rigidity of the CF frame really lead to a whole different (and better) flight experience when comparing it to the 300X. It flies very precise, very agile and it’s simply a blast to fly! First of all there is of course the selling price. 350€ which equals roughly USD470 is more than the machine is worth in my eyes – but this price will come down over the coming months (it already has slightly). 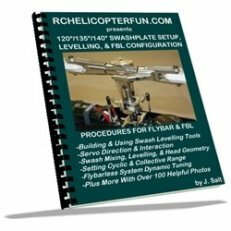 The carbon and aluminum parts increased the total weight of the helicopter – even when using a standard 1350mAh battery. Since the rotor dimension has not been altered this causes a higher disc load out of the box. When using a bigger battery to get the CG right, you increase the disc load even more, so I am forced to constantly run at high head speeds to compensate for that. Because of that it is certainly not as beginner friendly as the 300X was. Despite all the issues reported, this baby has become one of my favorite birds just like the 300X had been before! Once you have it set up correctly, it is really fun to fly with and has lots of potential for upgrades. In the meantime I have treated it with a 40A Roxxy ESC, an IISI telemetry and a Lynx EOX motor and I am even more satisfied with this machine – we are having lots of fun. But even with the standard setup it flies really nicely. 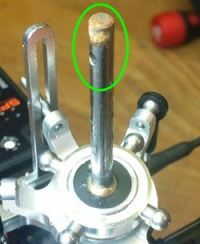 Unfortunately there have already been a few reports out there about failing motor-bearings and weak BECs (check helifreak.com) – I hate to say it, but this is not a surprise for me! Especially but not only when looking at the price tag I would have expected Horizon Hobby to put a little less focus on the servo geometry or the aluminum head and a little more on fixing the well-known issues like the motor bearing or the BEC – I think this is something that should have been overhauled before they threw out this “half bred version 2” on the market. What comes on top is this high number of quality and setup issues. I did report this to Horizon Hobby in Germany by the way, unfortunately they did not allow me to quote their answers. Anyway, one could get the impression that I simply had some bad fortune and picked one of a few 300 CFXs that had these issues. In order to see if my problems are unique, I visited a few hobby shops and innocently asked if I could see a Blade 300 CFX. I regret having to report, that all other 3 models I personally checked (randomly) had rusty parts (mainly a screw in the tail assembly) and they all had the BeastX dial 1 set to minimum as well. Now that does tell a story doesn’t it ? As far as suitability for beginners is concerned I must regretfully state that I will not recommend this helicopter any more like I did the 300X. And as long as the price stays at this level and the quality control issues are not eliminated I would even go so far to generally recommend not to purchase the Blade 300 CFX. I hope this review served you as a point of reference in case you wonder if the Blade 300 CFX might be the right helicopter for you. 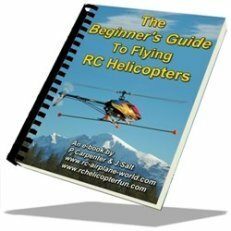 Do you have a RC helicopter review you would like to share on RC Helicopter Fun.com for others to benefit from like Ruedi has done here? If so, please contact me.